Shaman, Spiritual Healer, Shaman Teacher, Clairvoyant, and Medium are amongst his spiritual gifts. He has a special gift for accelerating a person’s spiritual growth. At a very early age, Victor’s unconditional love for God awakened a passion within him to help humanity heal itself. God has entrusted him with these special gifts and his ability to see and know beyond the normal limits of our physical senses ( incomprehensible). He is the author of “Humanity’s Spiritual Plague”, and he has established a school where student’s can practice his principles and learn how to effectively bring healing for their clients. Victor has a strong desire to share his knowledge and wisdom with everyone. His goal has always been to help people establish an unbreakable spiritual foundation and bond with God. Throughout his thirty-five years healing others, he has stressed the importance of humility, integrity and faith in God. 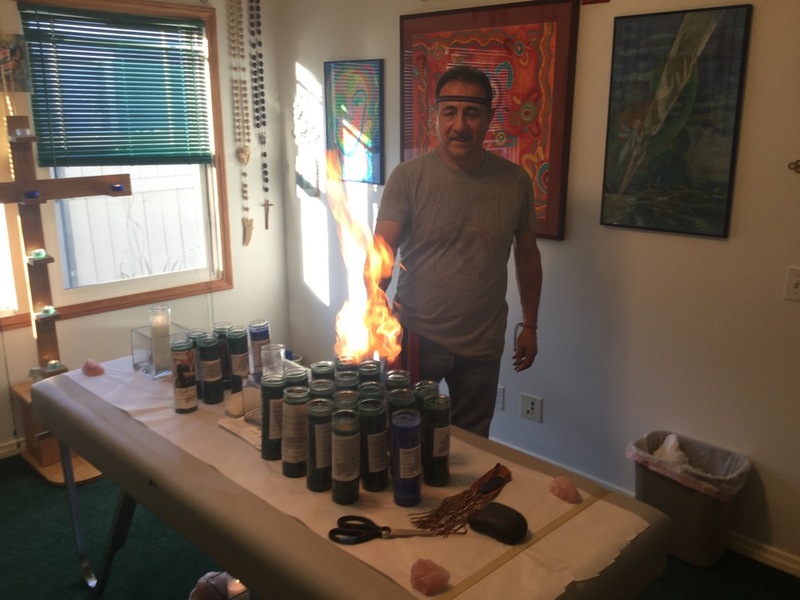 Shaman teacher Victor has taught and trained others who share this great need and burning desire to help humanity heal. He teaches his basic principles and provides ongoing training at the Body Mind Spirit Healing Center, the original training ground where it all began. Students from around the world come to experience his training firsthand to accelerate their spiritual development. During their training process, all students will experience continuous healing for themselves as they learn and understand their own God given spiritual gifts. Intermediate 2 will bring even more personal healing and spiritual growth. You will continue to expand your knowledge. 15 more new healing techniques will be taught to help free your clients and bring profound healing to their life's. You will have so much gratitude for all God will allow you to do. This healing meditation is no ordinary meditation - while you sit in meditation Shaman Victor Barron will work as an Instrument of God to perform a spiritual healing on you that will help you grow into Higher Consciousness. During Basic Level 2 you will be taught all the major prayers used for healing and anointed to use them as well as how to bless someone correctly. You'll learn proper Hands-On Healing, many people are trained in energy work, however you can easily over-energize someone, doing it correctly with God’s blessing will make the difference in hurting someone or helping them. You also be trained in the powerful “Shamanic Bowl of Life Healing” that will help you in emergency and urgent situations, in strong emotional situations, for serious illnesses, removal of witchcraft and negative energies, for close minded individuals and to offer blessings of good luck. A must-read for anyone interested in the spiritual world, Victor's book explains two of the biggest spiritual problems facing humanity today and outlines simple methods of resolving them that were given to him by God to teach humanity. Nine and a half years ago I had an 8-hour neck resection operation to remove malignant cancer from both sides of my neck. This operation was followed by three weeks of radiation therapy. The radiation badly damaged the enamel on all my teeth and restricted the blood flow within both jawbones. It also destroyed my taste buds and salivary glands. I was diagnosed with xerstomia or dry mouth. After a decade of being clean and sober, I felt like something was blocking me from moving forward in my new way of life. I wanted to share my experiences with others to help them reach their “higher good”. Victor pulled some sort of negative energy out of my body and cleansed every cell. He used his body like a vacuum and I was free. God talked to me that day through Victor and told me to go forward and be myself. He placed the keys of life in my palm and I put them into my heart. For five months I saw numerous doctors yet none were able to pinpoint my medical condition. They all wanted to operate. They would say that maybe it was the gallbladder, liver, etc. I hated the sight of myself. I would cut out my head from photos because of the terrible, piercing stare I saw in my eyes. I couldn’t even stand looking at myself in the mirror when shaving. About two months ago I saw two dogs. I stared at them with so much anger they came to attack me. I just kept staring at them. As one of them came to bite me, I picked up two good sized rocks. I hit the dog two times with a lot of rage. My anger was uncontrollable. When I finally realized what I was doing, I remembered I had my eight-year-old niece with me. She was very scared and could have been hurt. My symptoms were: antisocial behavior, change in personality, high and low energies, and bad dreams. People would visit and everything would bother me. My wife would say I needed to control my bad attitude so I would just go outside. It got to the point that I did not want to be in my own home with my family. I told my wife several times that I just wanted to die so I could have some peace. Many people are experiencing fear in this present day. I say to you, have faith, be strong, know that the great spirit has never abandon you. Take the time to communicate with God for he is anxious to establish a relationship with you. Fear is pushed into your face, through the news, radio and negative people expressing how bad everything is. I choose to look and experience everyday, in a positive way, that I am at the right place at the right time and that everyday is a great day, thank you God! I give thanks to God who allows me to see the sunrise once again. I have admiration for the beauty of the sunset. I have gratitude for everything. God is my strength. Fear is an illusion. It is not real. Do not disempower yourself by surrendering your will power. Refuse to accept negative thoughts to be a part of you. Stay centered within your heart. Love and forgive yourself. Forgive everyone. This act of forgiveness will empower you. Look at everyone with the eyes of unconditional love. Bless everyone. Bless mother earth. Be aware, feel, sense the presence of God within you. Feel a natural high. Be happy. Do not accept anything less than this. Remember like attracts like. If you think negative, you will attract negative. If you think positive, you will attract positive.